Need your help! “Wish list” for a student lab for tank experiments? Here are a couple of things I think need to be definitely considered. If the tank was to be replaced by a smaller one, how small could the smaller one be? If we want to be able to continue running these experiments, here is why we should not sacrifice the dimensions of the tank. The first reason for keeping the length of the tank is that the “mountains” being towed to create the lee waves are already 1 and 1.5m long, respectively. This is a length that is “lost” for actual experiments, because obviously the mountain needs space inside the tank on either end (so in its start and end position). Additionally, when the mountain starts to move, it has to move for some distance before the flow starts displaying the features we want to present: Initially, there is no reservoir on the “upstream” side of the mountain and it only builds up over the first half meter or so. The third reason for keeping the length of the tank is its purpose: as teaching tank. Even if one might get away with a slightly shorter tank for experiments when you just film and investigate the short stretch in the middle of the tank where there are no issues with either the push you gave the system when starting the experiment or the reflections when you get near the end, the whole purpose of the tank is to have students observe. This means that there needs to be a good amount of time where the phenomenon in question is actually present and observable, which, for the tank, means that it has to be as long as possible. In the experiments mentioned above, with exception of the “dead water” experiment, the tank represents a “slice” of the ocean. We are not interested in changes across the width of the tank, and therefore it does not need to be very wide. However, if there is water moving inside the tank, there will be friction with the side walls and the thinner the tank, the more important the influence of that friction will become. If you look for example at the surface imprint of internal wave experiment, you do see that the flow is slowed down on either side. So if you want flow that is outside of the boundary layers on either side, you need to keep some width. Secondly, not changing the tank’s width has the advantage that no new mountains/ships need to be built. Another, practical argument for a wide-ish tank (that I feel VERY strongly about) is that the tank will need to be cleaned. Not just rinsed with water, but scrubbed with a sponge. And I have had my hands inside enough tanks to appreciate if the tank is wide enough that my arm does not have to touch both sides at all times when reaching in to clean the tank. The first reason for keeping the height is that for the “dead water” experiment, even the existing tank is a lot shallower than what we’d like from theory (more here). If we go shallower, at some point the interactions between the internal waves and the ground will become so large that it will mess up everything. 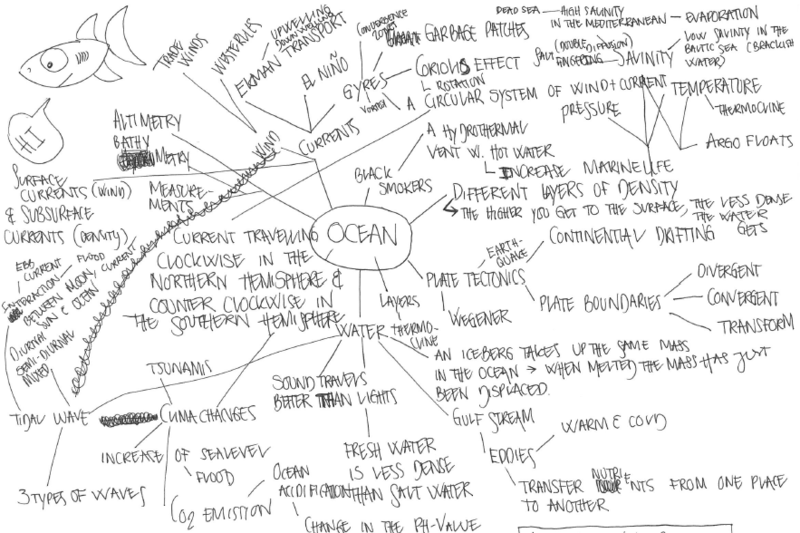 Without getting too philosophical here about models and what they can and cannot achieve (and tank experiments being models of phenomena in the ocean), the problem is that scaling of the ocean into a tiny tank does not work, so “just use a mountain/boat half the size of the existing ones!” is actually not possible. Similarly to how if you build the most amazing model train landscape, at some point you will decide that tiny white dots are accurate enough representations of daisies on a lawn, if you go to a certain size, the tank will not be able to display everything you want to see. So going smaller and smaller and smaller just does not work. A more in-depth and scientific discussion of the issue here. The tank should be made of glass or some other material that can get scrubbed without scratching the surface. Even if there is only tap water in the tank, it’s incredible how dirty tanks get and how hard they have to be scrubbed to get clean again! The tank needs plenty of inlets for source waters to allow for many different uses. With the current tank, I have mainly used an inlet through the bottom to set up stratifications, because it allowed for careful layering “from below”. But sometimes it would be very convenient to have inlets from the side close to the bottom, too. And yes, a hose could also be lowered into the tank to have water flow in near the bottom, but then there needs to be some type of construction on which a hose can be mounted so it stays in one place and does not move. We need mechanism to tow mountains and ships. The current tank has two different mechanisms set up, one for mountains, one for ships. 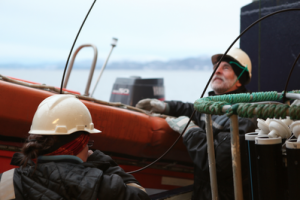 While the one for the ship is home-made and easily reproducible in a different setting (instructions), the one to tow the mountain with is not. If there was a new mechanism built, one would need to make sure the speeds at which the mountain can be towed matches the internal wave speed to be used in the experiment, which depends on the stratification. This is easy enough to calculate, but it needs to be done before anything is built. And the mechanism does require very securely installed pulleys at the bottom of the tank which need to be considered and planned for right from the start. The “source” reservoirs (plural!) are the reservoirs in which water is prepared before the tank is filled. It is crucial that water can be prepared in advance; mixing water inside the tank is not feasible. Both reservoirs should sit above the height of the tank so that the water can be driven into the tank by gravity (yes, pumps could work, too, more on that below). If reservoirs cannot be located above and below tank height to use gravity to fill and empty the tanks, we need pumps (plural). Ideally, a second pump that can be regulated very precisely, so the double bucket method of setting up a stratification in a tank can be done automated rather than relying on gravity. Preferable the first and the latter are not the same, because changing settings between calibrating the pump for an experiment, setting it on full power to empty the tank, and calibrating it again will cause a lot of extra work. I’ve worked for years with whatever hoses I could find, and tons of different adapters to connect the hoses to my reservoir, the tap, the tank. It would be so much less of a hassle if someone thought through which hoses will actually be needed, bought them at the right diameter and length, and outfitted them with the adapters they needed to work. 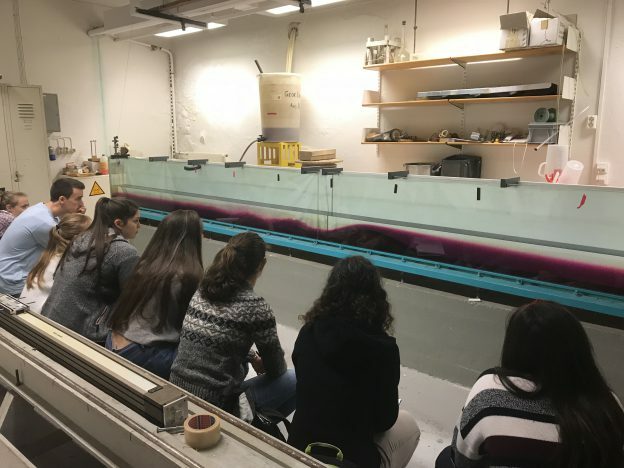 The tank needs to be accessible from the back side so the experimenter can run the experiment without walking in front of the observers (since the whole purpose of the tank is to be observed by students). The experimenter also needs to be able to get out from behind the tank without a hassle so he or she can point out features of interest on the other side. Also, very importantly, the experimenter needs to be able to reach taps very quickly (without squeezing through a tight gap or climbing over something) in case hoses come loose, or the emergency stop for any mechanism pulling mountains in case something goes wrong there. There needs to be enough room to have a class of 25ish students plus ideally a handful of other interested people in the room. But not only do they need to fit into the room, they also need to be able to see the experiments (they should not have to stand in several rows behind each other, so all the small people in the back get to see are the shoulders of the people in front). Ideally, there will be space so they can duck down to have their eyes at the same height as the features of interest (e.g. the density interface). If the students don’t have the chance to observe, there is no point of running an experiment in the first place. Ideally, when designing the layout of the room, it is considered how tank experiments will be documented, i.e. most likely filmed, and there needs to be space at a sufficient distance from the tank to set up a tripod etc.. Both for direct observations and for students observing tank experiments, it is crucial that the lighting in the room has been carefully planned so there are minimal reflections on the walls of the tank and students are not blinded by light coming through the back of the tank if a backlighting solution is chosen. 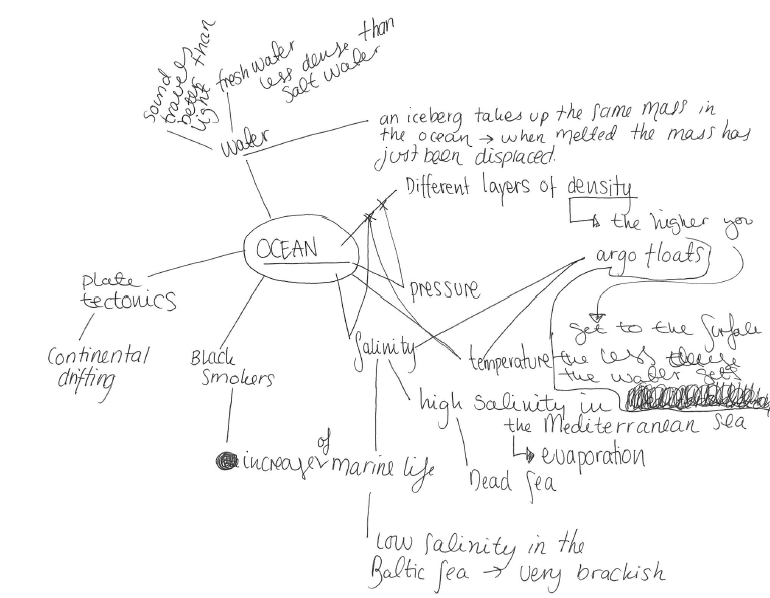 This entry was posted in demonstration (difficult), method, tank experiment and tagged GEOF105, GEOF130, GEOF213, GEOF332, student engagement, students, tank experiment, tank experiments, teaching on January 5, 2019 by mglessmer. So how do we teach about the Coriolis force? 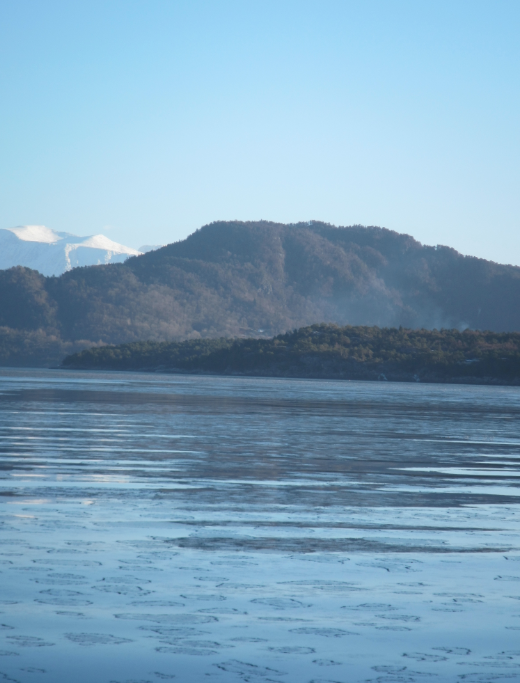 The following is a shortened version of an article that Pierre de Wet and I wrote when I was still in Bergen, check it out here. A demonstration observing a body on a rotating table from within and from outside the rotating system was run as part of the practical experimentation component of the “Introduction to Oceanography” semester course. 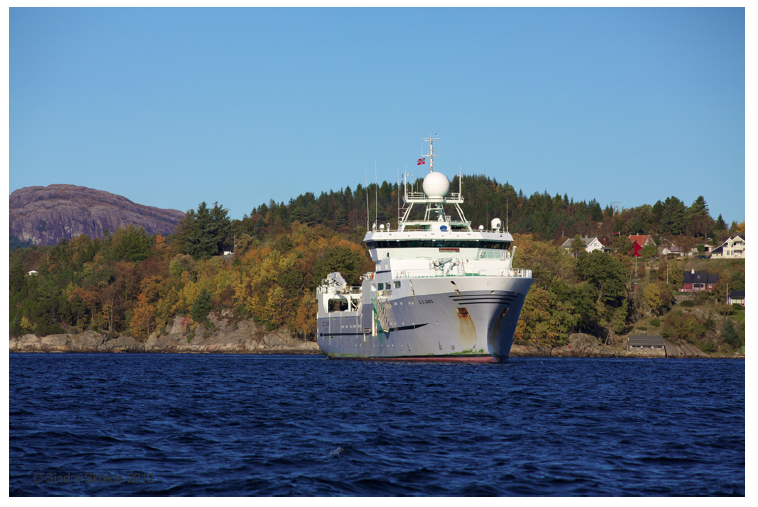 Students were in the second year of their Bachelors in meteorology and oceanography at the Geophysical Institute of the University of Bergen, Norway. 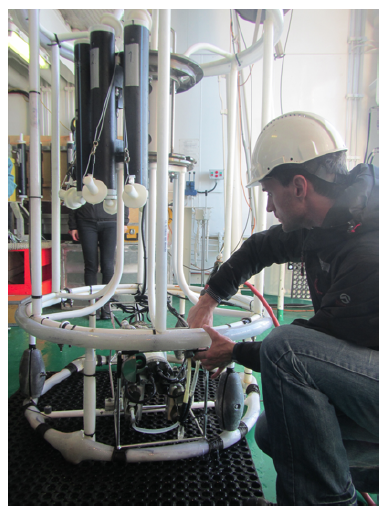 Similar experiments are run at many universities as part of their oceanography or geophysical fluid dynamics instruction. Figure 1A: View of the rotating table. Note the video camera on the scaffolding above the table and the red x (marking the catcher’s position) on the floor in front of the table, diametrically across from where, that very instant, the ball is launched on a ramp. B: Sketch of the rotating table, the mounted (co-rotating) camera, the ramp and the ball on the table. C: Student tracing the curved trajectory of the metal ball on a transparency. 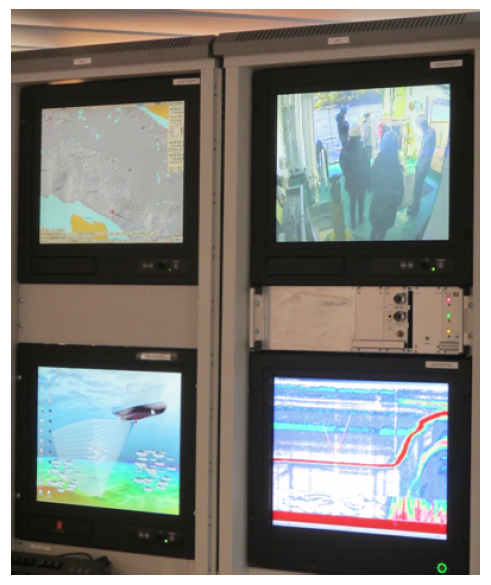 On the screen, the experiment is shown as filmed by the co-rotating camera, hence in the rotating frame of reference. About 45 minutes to one hour per student group. The groups should be sufficiently small so as to ensure active participation of every student. In our small lab space, five has proven to be the upper limit on the number of students per group. compare the trajectory’s radius to the theorized value. The latter is calculated from the measured rotation rate of the table and the linear velocity of the ball, determined by launching the ball along a straight line on the floor. 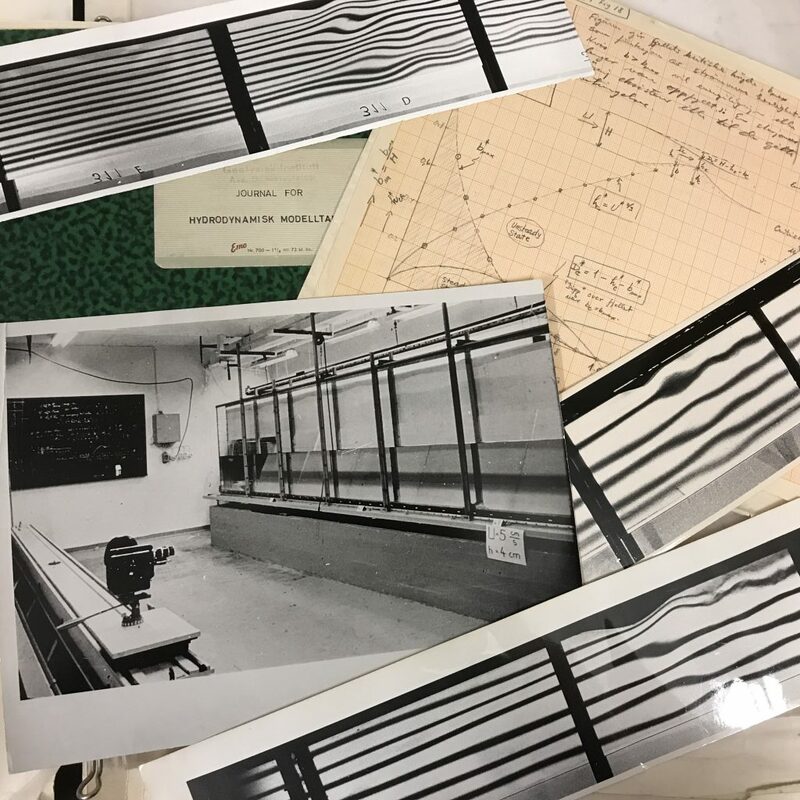 In years prior to 2012, the course had been run along the conventional lines of instruction in an undergraduate physics lab: the students read the instructions, conduct the experiment and write a report. In 2012, we decided to include an elicit-confront-resolve approach to help students realize and understand the seemingly conflicting observations made from inside versus outside of the rotating system (Figure 2). The three steps we employed are described in detail below. Figure 2: Positions of the ramp and the ball as observed from above in the non-rotating (top) and rotating (bottom) case. Time progresses from left to right. In the top plots, the position in inert space is shown. From left to right, the current position of the ramp and ball are added with gradually darkening colors. In the bottom plots, the ramp stays in the same position, but the ball moves and the current position is always displayed with the darkest color. The goal of this first step is to make students aware of their beliefs of what will happen in a given situation, no matter what those beliefs might be. By discussing what students anticipate to observe under different physical conditions before the actual experiment is conducted, the students’ insights are put to the test. 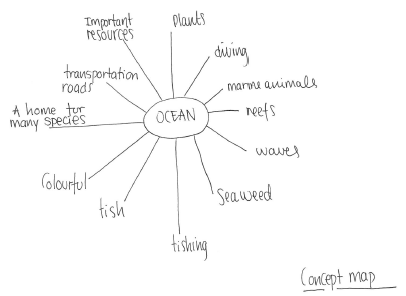 Sketching different scenarios (Fan (2015), Ainsworth et al. (2011)) and trying to answer questions before observing experiments are important steps in the learning process since students are usually unaware of their premises and assumptions. These need to be explicated and verbalized before they can be tested, and either be built on, or, if necessary, overcome. Students have been taught in introductory lectures that in a counter-clockwise rotating system (i.e. in the Northern Hemisphere) a moving object will be deflected to the right. They are also aware that the extent to which the object is deflected depends on its velocity and the rotational speed of the reference frame. 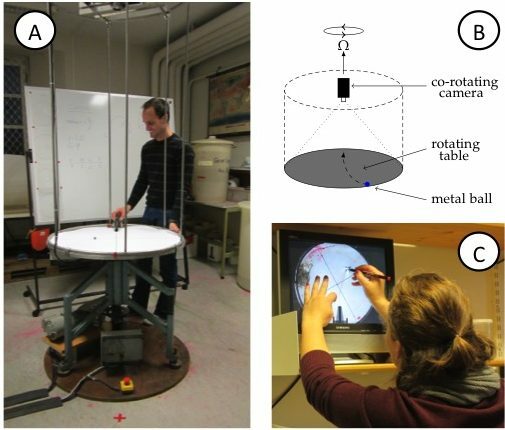 A typical laboratory session would progress as follows: students are asked to observe the path of a ball being launched from the perimeter of the circular, not-yet rotating table by a student standing at a marked position next to the table, the “launch position”. The ball is observed to be rolling radially towards and over the center point of the table, dropping off the table diametrically opposite from the position from which it was launched. So far nothing surprising. A second student – the catcher – is asked to stand at the position where the ball dropped off the table’s edge so as to catch the ball in the non-rotating case. The position is also marked on the floor with insulation tape. The students are now asked to predict the behavior of the ball once the table is put into slow rotation. At this point, students typically enquire about the direction of rotation and, when assured that “Northern Hemisphere” counter-clockwise rotation is being applied, their default prediction is that the ball will be deflected to the right. When asked whether the catcher should alter their position, the students commonly answer that the catcher should move some arbitrary angle, but typically less than 90 degrees, clockwise around the table. The question of the influence of an increase in the rotational rate of the table on the catcher’s placement is now posed. “Still further clockwise”, is the usual answer. This then leads to the instructor’s asking whether a rotational speed exists at which the student launching the ball, will also be able to catch it him/herself. Ordinarily the students confirm that such a situation is indeed possible. For those cases in which the “elicit” step brought to light assumptions or beliefs that are different from the instructor’s, the “confront” step serves to show the students the discrepancy between what they stated to be true, and what they observe to be true. The students’ predictions are subsequently put to the test by starting with the simple, non-rotating case: the ball is launched and the nominated catcher, positioned diametrically across from the launch position, seizes the ball as it falls off the table’s surface right in front of them. 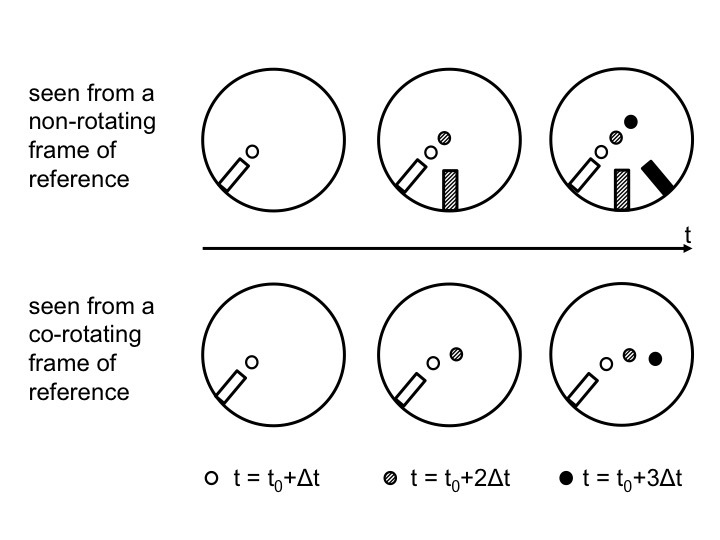 As in the discussion beforehand, the table is then put into rotation at incrementally increasing rates, with the ball being launched from the same position for each of the different rotational speeds. It becomes clear that the catcher need not adjust their position, but can remain standing diametrically opposite to the student launching the ball – the point where the ball drops to the floor. Hence students realize that the movement of the ball relative to the non-rotating laboratory is unaffected by the table’s rotation rate. This observation appears counterintuitive, since the camera, rotating with the system, shows the curved trajectories the students had expected; circles with radii decreasing as the rotation rate is increased. Furthermore, to add to their confusion, when observed from their positions around the rotating table, the path of the ball on the rotating table appears to show a deflection, too. This is due to the observer’s eye being fooled by focusing on features of the table, e.g. cross hairs drawn on the table’s surface or the bars of the camera scaffold, relative to which the ball does, indeed, follow a curved trajectory. To overcome this latter trickery of the mind, the instructor may ask the students to crouch, diametrically across from the launcher, so that their line of sight is aligned with the table’s surface, i.e. at a zero zenith angle of observation. From this vantage point the ball is observed to indeed be moving in a straight line towards the observer, irrespective of the rate of rotation of the table. To further cement the concept, the table may again be set into rotation. The launcher and the catcher are now asked to pass the ball to one another by throwing it across the table without it physically making contact with the table’s surface. As expected, the ball moves in a straight line between the launcher and the catcher, who are both observing from an inert frame of reference. However, when viewing the playback of the co-rotating camera, which represents the view from the rotating frame of reference, the trajectory is observed as curved. Misconceptions that were brought to light during the “elicit” step, and whose discrepancy with observations was made clear during the “confront” step, are finally corrected in the “resolve” step. While this sounds very easy, in practice it is anything but. The final step of the elicit-confront-resolve instructional approach thus presents the opportunity for the instructor to aid students in reflecting upon and reassessing previous knowledge, and for learning to take place. The instructor should by now be able to point out and dispel any remaining implicit assumptions, making it clear that the discrepant trajectories are undoubtedly the product of viewing the motion from different frames of reference. Despite the students’ observations and their participation in the experiment this is not a given, nor does it happen instantaneously. Oftentimes further, detailed discussion is required. Frequently students have to re-run the experiment themselves in different roles (i.e. as launcher as well as catcher) and explicitly state what they are noticing before they trust their observations. We used the described activity to introduce the laboratory activity, after which the students had to carry out the exercise and write a report about it. 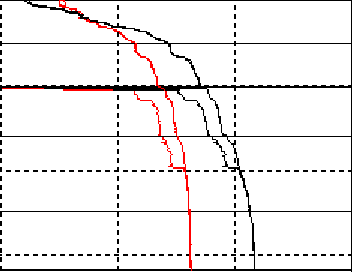 Follow-up experiments that are often conducted usually include rotating water tanks to visualize the effect of the Coriolis force on the large-scale circulation of the ocean or atmosphere, for example on vortices, fronts, ocean gyres, Ekman layers, Rossby waves, the General circulation and many other phenomena (see for example Marshall and Plumb (2007)). Despite their popularity in geophysical fluid dynamics instruction at the authors’ current and previous institutions, rotating tables might not be readily available everywhere. Good instructions for building a rotating table can, for example, be found on the “weather in a tank” website, where there is also the contact information to a supplier given: http://paoc.mit.edu/labguide/apparatus.html. A less expensive setup can be created from old disk players or even Lazy Susans. In many cases, setting the exact rotation rate is not as important as having a qualitative difference between “fast” and “slow” rotation, which is very easy to realize. In cases where a co-rotating camera is not available, by dipping the ball in either dye or chalk dust (or by simply running a pen in a straight line across the rotating surface), the trajectory in the rotating system can be visualized. 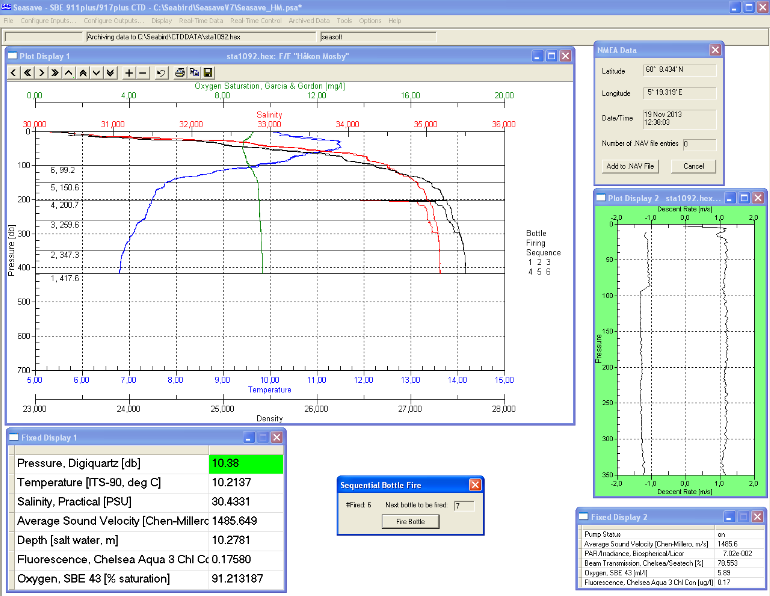 The method described in this manuscript is easily adapted to such a setup. Lastly we suggest using an elicit-confront-resolve approach even when the demonstration is not run on an actual rotating table. Even if the demonstration is only virtually conducted, for example using Urbano & Houghton (2006)’s Coriolis force simulation, the approach is beneficial to increasing conceptual understanding. This entry was posted in demonstration (difficult), hand-on activity (difficult) and tagged Coriolis, Coriolis deflection, fictitious force, GEOF130 on January 24, 2017 by mglessmer. How to make lectures in a foreign language less scary for the students. 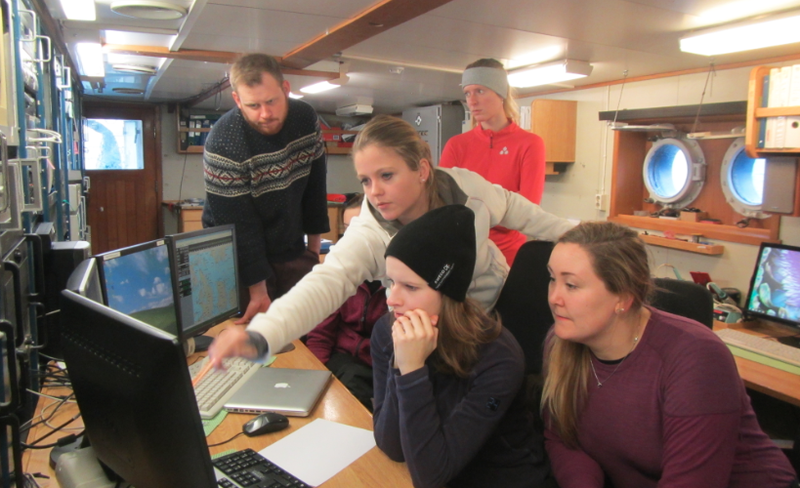 The class that I have until recently taught in Bergen, GEOF130, is taken by students in oceanography and meteorology in the second year of their Bachelor at the university. It is the first course they take at the Geophysical Institute – their first year is spent entirely at other institutes. The Bachelor is taught in Norwegian – with the exception of GEOF130. This course is taught in English, because it also serves the Nordic Master, which is taught in English, and that brings in many students who don’t speak Norwegian. While I am glad the course had to be held in Norwegian (I would definitely not have had the time to prepare 4 hours of lectures per week for a whole semester in Norwegian! ), many of the students were not happy. They typically understand everything you say just fine, but there is a huge barrier when it comes to speaking in front of their peers in a foreign language. The easiest way to cope with the shyness I found is to speak to them in my less-than-perfect Norwegian. Seeing the teacher make funny mistakes in a foreign language makes it a lot easier for them to dare making mistakes in another foreign language. Yet students often choose to write the exam in Norwegian (and yes – I have to pose the questions in English, Nynorsk and Bokmål!). Which often leads to problems, since all of the lectures and all of the reading materials were in English, so the students don’t actually know any of the technical terms in Norwegian and often end up inventing them or, worse, mixing them up with similar sounding but not otherwise related Norwegian terms. So the next thing to do is to always try and be aware of which terms they are likely to know and which are technical terms. This is not always easy and depends a lot on what their native language is (see this post). One thing I did early on when I started teaching was to create a small dictionary of oceanographic terms in English, Norwegian and German. Anyone out there who wants to help edit that dictionary? And everybody, please feel free to share if you think this might be useful to someone else! This entry was posted in pondering and tagged foreign language, GEOF130, language on December 20, 2013 by mglessmer. The first student cruise I ever taught while being taught by one of the greatest teachers myself. 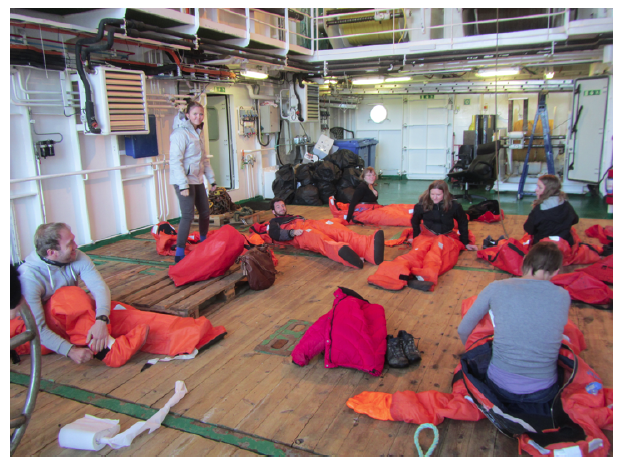 As you might have noticed from the last four or so blog posts, I really enjoy teaching student cruises and I think they are a super important part of the oceanography education. So let me tell you about the first student cruise I taught. 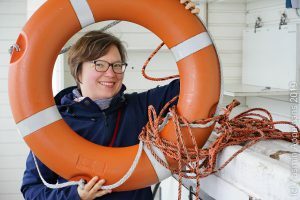 I was lucky enough to co-teach it with one of the most experienced and knowledgeable oceanographers out there, who was excited about sharing with me all there is to know about cruise planning, cruise leading, teaching at sea and many other topics. 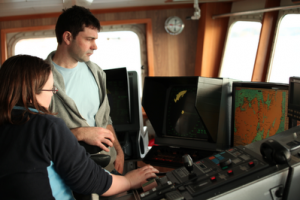 Me and Anne on watch during that student cruise. Picture courtesy of Angus Munro. From the first day of the first cruise onward, my ideas and contributions were welcomed, and I got to heavily influence the scientific program of the cruise. On the second day of the first cruise, I was told to just walk up to the captain and tell him if I wanted to change the course and go measure somewhere else than planned. 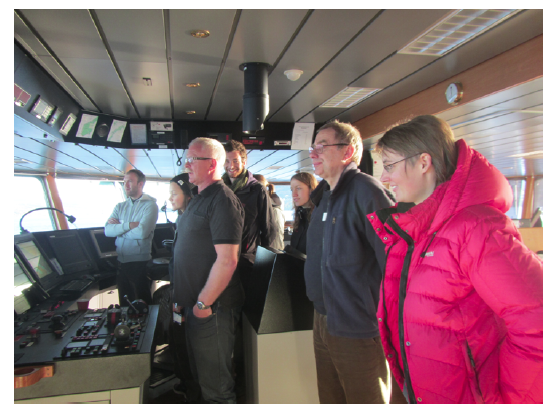 On the bridge, discussing the scientific plan for the next day. Picture courtesy of Angus Munro. The cruise ended up being great learning experiences for me. For the first time, I got to decide how to allocate ship time to best investigate the question that I thought was most interesting, a topic that I had never had (the chance) to deal with previously. Getting the small boat ready to recover a mooring. Photo courtesy of Angus Munro. At the same time, I had the opportunity to learn from – and work with – the best. 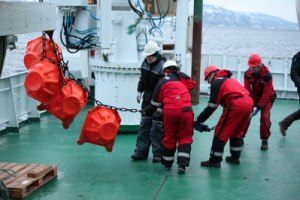 One of the practical highlights: A mooring release had not been working reliably in the past, but it was the one that we had with us on this cruise. So what to do? 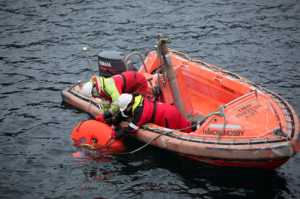 Recovering a mooring. Photo courtesy of Angus Munro. And then I got to spend a lot of my time on watch (and a lot of my time off watch) discussing what we were seeing in the new data, what we could learn from that, where we should go next to prove or disprove our new theories. And I got to watch a great teacher interact with his students (other than me). I saw how he challenged, how he encouraged, how he helped, how he guided, how he inspired. Bringing the mooring back on deck. Photo courtesy of Angus Munro. Thank you so much, Tor, for being the role model you are and for having given me all of this, which I have since been striving to give to my own students. All photos in this post were taken by Angus Munro (thanks!) 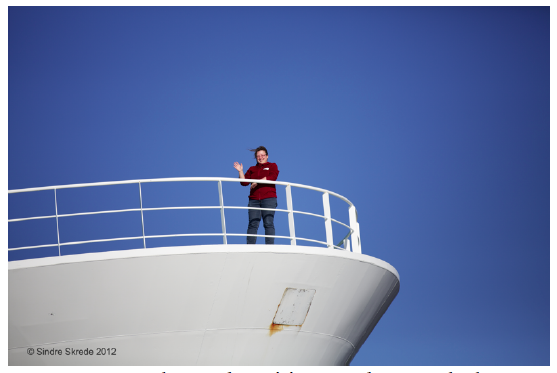 on the 2012 GEOF332 student cruise. 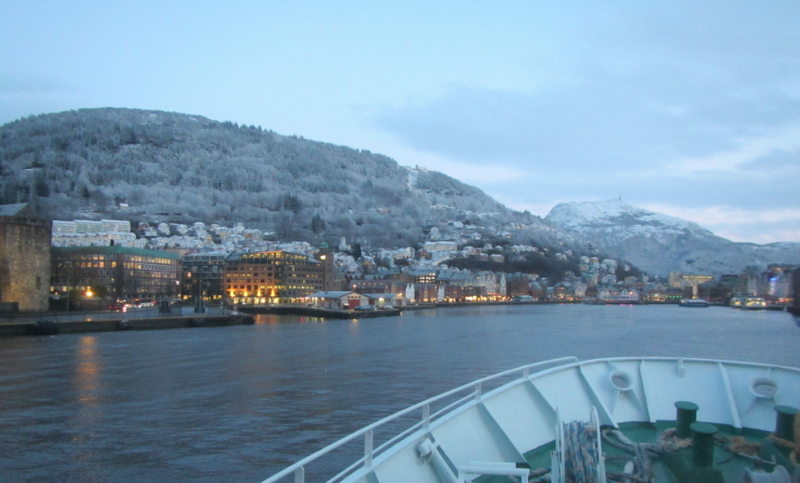 This entry was posted in pondering and tagged GEOF130, GEOF332, student cruise on December 18, 2013 by mglessmer. When a CTD profile suddenly looks really weird. 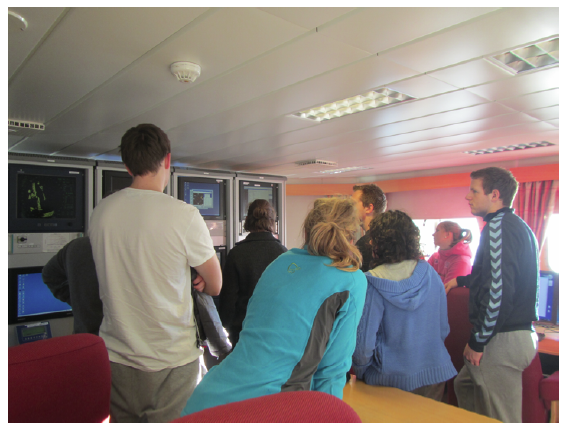 As mentioned before, student cruises seem to bring out the weird experiences with CTDs. My theory is that it’s the world testing us. It would be bad enough to deal with this stuff if we were on CTD watch in the middle of the night on our own, but dealing with it in front of a group of eager students, all asking questions when you just want to think, is the ultimate test of whether you know your stuff and have the nerves to deal with anything. A really weird offset between downcast and upcast occurred in density and salinity, persisted for about 100m, ended with a huge spike and then disappeared. So what happened? I have actually no idea. I’ve seen jellyfish being sucked into the pump, resulting in fresh spikes. And that salinity and density react very similarly even for anomalies is not that surprising, seeing that one is calculated from the other. But why would the shape of the profile stay the same, only shifted towards fresher values and lower densities? Ideas, anyone? 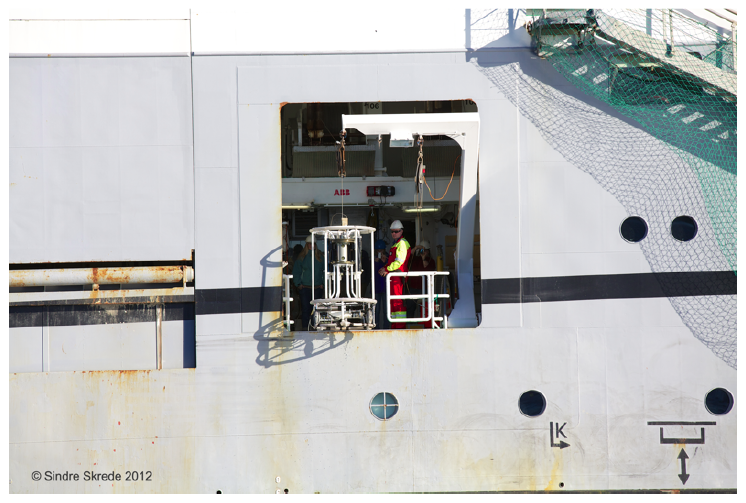 This entry was posted in demonstration (difficult) and tagged CTD, GEOF130, student cruise on December 16, 2013 by mglessmer.